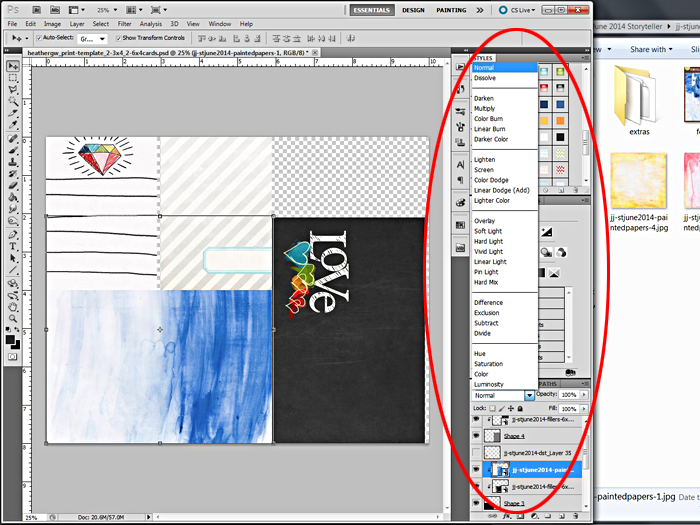 So, last week I showed you how to use my freebie hybrid print templates to print and cut your journal cards or papers to fit in your pocket page protectors. This week, we're going to take it a step further and alter our journal cards and papers by blending additional cards and papers over them. This is my favorite way of altering cards every week in my Project Life pocket scrapbook album and I can't wait to show you how I do it. Again, I'm using Just Jaimee's June 2014 Storyteller Collection. Be sure to sign up for her newsletters for crazy awesome special deals on the Storyteller Collection when it's released. She does the crazy deal only for her newsletter subscribers and for a limited time. You don't want to miss it. 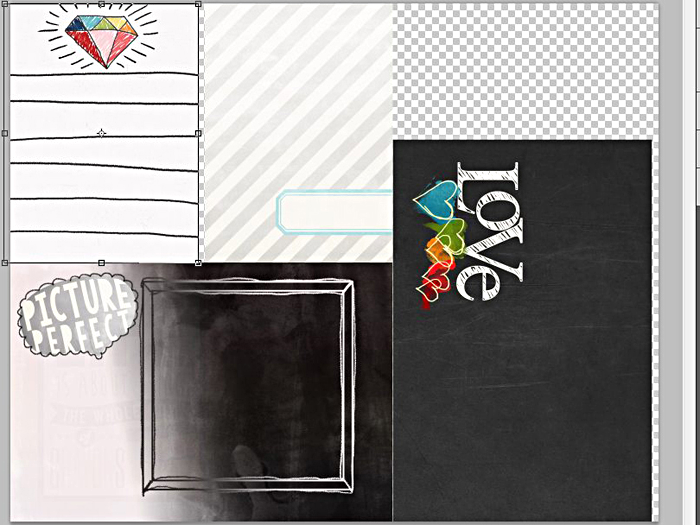 First, we're going to start off with a new set of journal cards and papers that are clipped to the freebie template, like we did last week. I'm going to first show you how to blend your papers over the top of them and then will show you how to blend a card on top of one. I want to change the coloring of the bottom left 6"x4" journal card to a blue color instead of the black/gray. 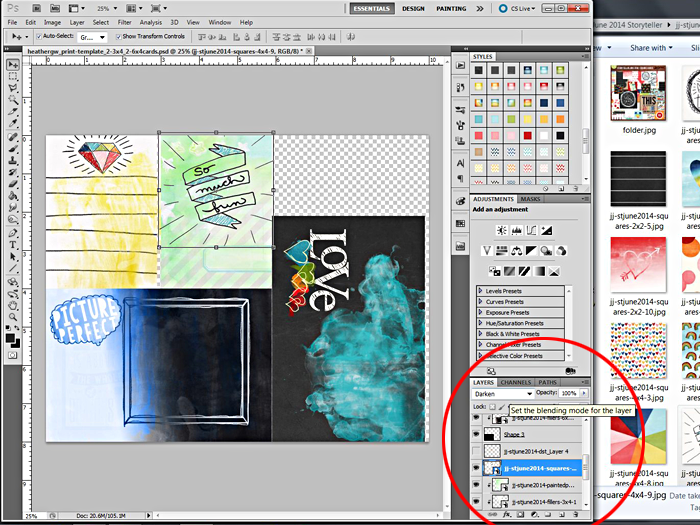 To do this I first made sure the journal card's layer is chosen in the layers palette so that the paper I'm using will be directly over the journal card. I then grabbed a blue paper from the painted papers and dragged it over top of the journal card. I also resized it to fit over just the card to utilize the whole painted gradient of the paper rather than just a part of it. 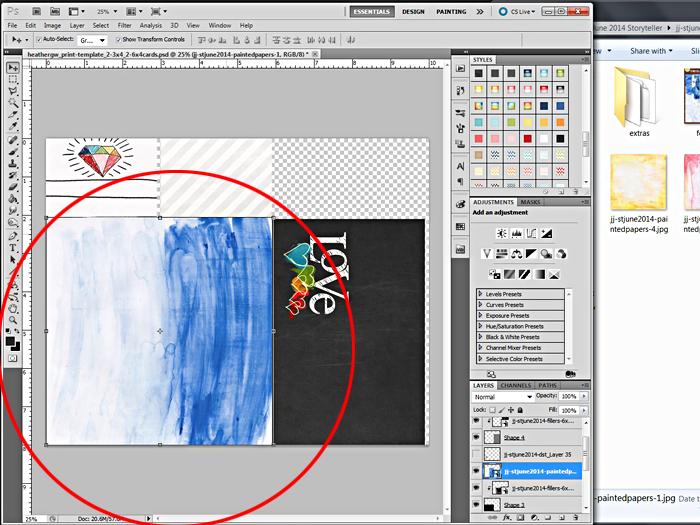 To resize click a corner of the transform box, drag the corner while holding down the shift key. The Shift key prevents any distortion of the paper, so make sure you're using it. Next, I clipped the paper to the top of the journal card so it's not covering any of the other cards. We went over how to do this last week. I like to use CTRL-ALT-G to clip. 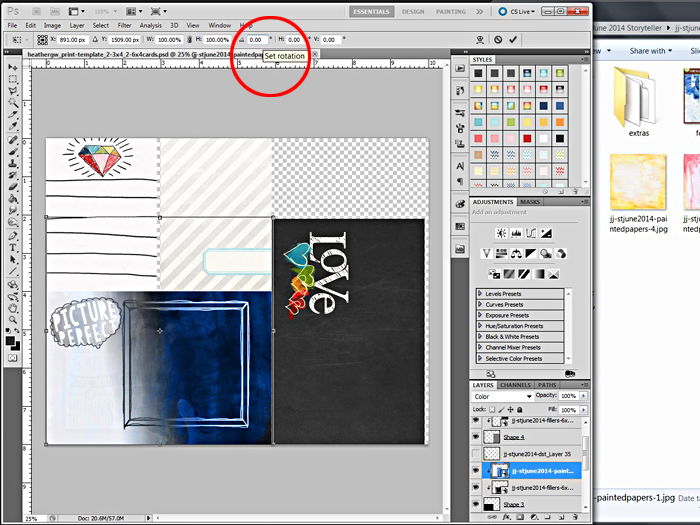 You will see just the paper now over the top of the journal card, but don't worry, you'll see the card again when we blend it. Here's where the fun begins! We are once again looking in the layers palette. At the very top left-hand corner you will see a box that says "Normal" and has an upside down triangle next to it. Click on the triangle to bring up the menu. This is where we will change the blend mode of the paper we just clipped on top. 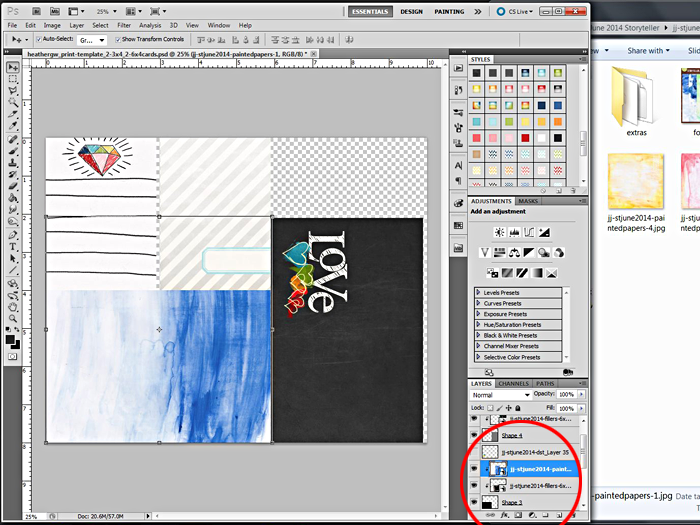 All of these options will give you different effects for blending the paper you just clipped on top with the journal card below it. Try them all out to find the blend mode that you like most. For this example, I like the "color" mode best. I decided that I wanted the blue paint over on the other side of the journal card, so we're going to pause a little bit to show you how I did that. Click one of those eight tiny squares of the box around the paper layer, or use CTRL-T. This brings up the transform toolbar above the canvas. In the toolbar you will see several boxes with numbers. One of the boxes has a little right angle triangle in front of it. This is where you change the angle of the paper. To flip it so that the painted blue area of the paper is on the other side of the journal card, I'm going to enter "180" in that box. This just flipped that paper 180 degrees to put the blue area of the paper over the white area of the journal card and really bring out the blue on the card. Click the check mark to finish if you like it. OK, back to playing with blending... I wanted to change the gray striped card to another color. To do this, I went through the same steps above only I chose a different blend mode. 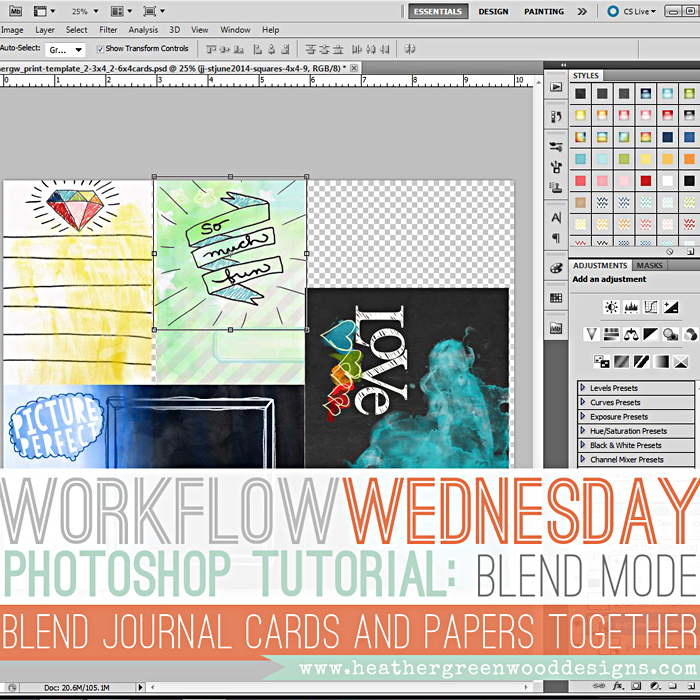 I liked the "Darken" best, but this shows you how different each of the blend modes are and the different effects you can have with blending your cards and papers together. I really liked the sentiment on this smaller 3"x3" card in the squares folder. I wanted to add it to the stripey card I had just altered. NOTE: because the background of this card is white, it worked to have the smaller card over the top, but normally you'll want to use cards that are the same size, not different sizes. First, I dragged the card and positioned it where I wanted it to be. I wanted to see the little label on the bottom of the card and have the sentiment above it. I then clicked on the check mark once I had it where I wanted it to be. I then changed the blend mode to "Darken". The white background totally disappeared. With several of the other blend modes you would still see the white background. This is why it's important to really test what the different blend modes look like. If I had used a smaller card with a color background other than white, you would be able to tell that I used a different sized journal card over the top and you would see the edge of the top card over the bottom card. If I had used a 3"x4" journal card, it wouldn't be as obvious that I had a card over the top and it would have blended nicely together in other blend modes without being so obvious. That's it! Have fun with trying out the different blend modes. If you do, I'd love to see what you've done so please share them with me. If you have any questions, feel free to contact me, I'd be happy to help you out. I'll be back next week with a tutorial on how to alter these cards using brushes, stamps and cut file PNG files. We're going to have some fun!